In 2010, the World Challenge Championship kicked off at St. Petersburg, Florida in March as a support event for the IndyCar series. In previous years, the championship participated in more race weekends with the American Le Mans Series but in 2010 World Challenge began sharing more events with IndyCar. The season ended mid-September at Miller Motorsports Park. In all, there were a total of twelve races at eight different venues (Streets of St. Petersburg, Long Beach, Mosport, Watkins Glen, Toronto, Mid-Ohio, Virginia International Raceway and Miller Motorsports Park). Grand Touring (GT) – This group included the series quickest cars: Porsche 911 GT3, Chevrolet Corvette, Dodge Viper, Nissan GT-R and Volvo S60. The preparation rules remained unchanged from the previous year for these vehicles. Grand Touring Sport (GTS) – These were many of the cars that competed in last year’s Touring Car class (Acura TSX, Honda Civic, BMW 325i and Mazda 6). Competitors from the Ford Racing Mustang Challenge were also able to participate using the Ford Mustang FR500S. 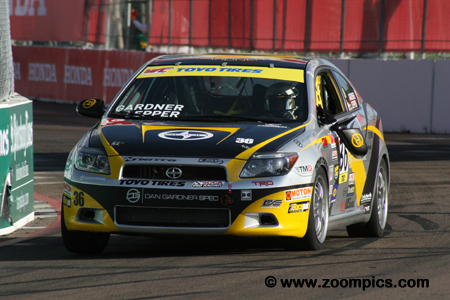 Touring Car (TC) – Touring Cars were not allowed many of the modifications permitted by the 2009 rules. The preparation of the vehicles was more closely aligned with Grand Am Cup and the Sports Car Club of America’s Improved Touring classes. 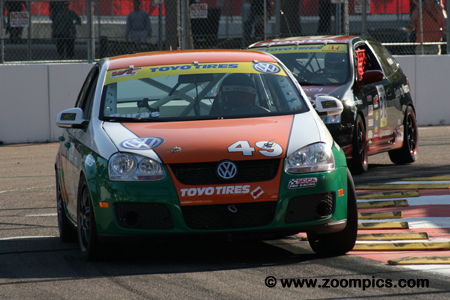 Makes competing in the category included the Scion tC, Mazda RX-8, Honda Civic, MAZDASPEED3, Volkswagen Jetta and Golf. 2010 also marked the end of races for each class. In the new season, all classes competed in the same 50-minute race – 1996 was the last time that categories competed together. Rounds one and two of the 2010 World Challenge champion were conducted at Saint Petersburg, Florida. Competitors in the Grand Touring, Grand Touring Sport and Touring Car classes would race in two fifty-minute contests around the fourteen-turn 1.800-mile temporary street course. The teams and series officials were fortunate that the heavy rains held off until after Sunday’s race. The IndyCar event was postponed until Monday. The Grand Touring Sport podium for round two at the Streets of Saint Petersburg. The RealTime team swept the weekend with the results from round one repeated on Sunday. In the center is the winner and team principal, Peter Cunningham. 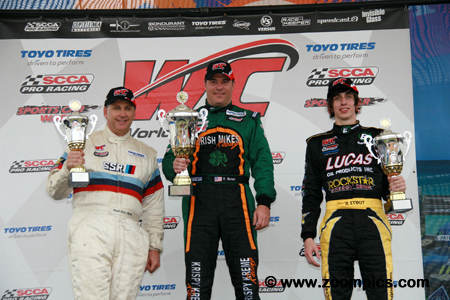 On the right is 2009 World Challenge GT champion, Brandon Davis who captured the runner-up position. Completing the rostrum is the third-place finisher, Nick Esayian. Randy Pobst led the season’s first race flag-to-flag. His victory was made that much easier when fellow front row starter, Dino Crescentini pitted on the formation lap with an electrical issue. On Sunday, pole-sitter, Pobst was the one to suffer misfortune. The engine in K-PAX Racing Volvo S60 began to overheat early in the race forcing him to pit. Pobst returned to the contest two-laps down and finished fourteenth in class. Despite being challenged by slower and faster traffic during the weekend, RealTime Racing team principal, Peter Cunningham led both rounds one and two flag-to-flag. These results gave the driver of the No. 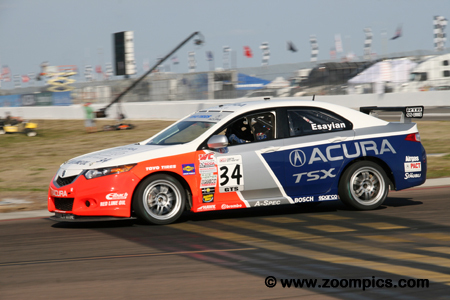 43 Acura TSX, his thirty-third and thirty-fourth wins in World Challenge competition. It also allowed Cunningham to take a commanding lead in the Grand Touring Sport title chase. Dino Crescentini driving the No. 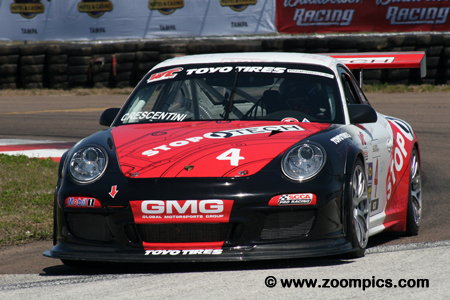 4 GMG prepared Porsche 911 GT3 qualified on the outside of the front row for the first race of the season. Unfortunately for Crescentini, the Porsche developed an electrical issue on the formation lap and he pitted. His race went much better the following day. Starting second, Crescentini got away first and led the entire contest – scoring his third World Challenge series career victory. 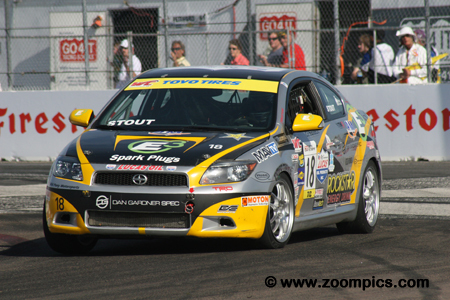 Series rookie, Robert Stout raced TRD/Lucas Oil sponsored Scion tC. 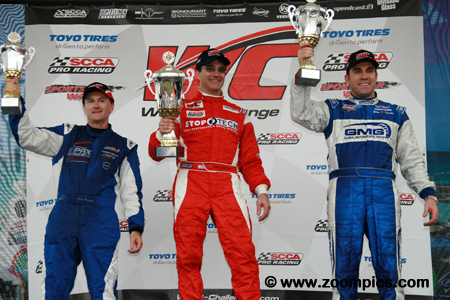 Stout started round one third in the Touring Car class and challenged the leaders, Todd Buras and Mark Hein. When Hein retired, he inherited a second place finish. It was much the same on Sunday until a mid-race caution caused him to lose a lap to Todd Buras. Unable to overcome this deficit, he scored his second runner-up result of the weekend. Todd Buras made things difficult for himself in his first World Challenge outing. In race one, Buras found himself staged ahead of his assigned starting spot and backed-up. Unfortunately, he was still in reverse when the starting lights went out and lost several positions. Buras chased down the other TC competitors and earned the victory. Round two went much better; he regained a couple of places lost at the start and won. 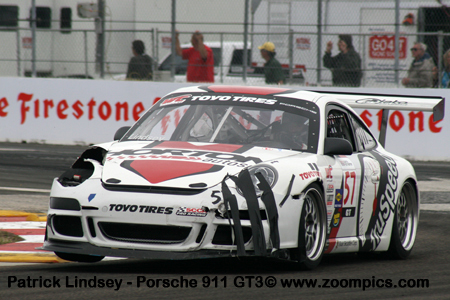 2009 World Challenge GT champion, Brandon Davis was a late entry. 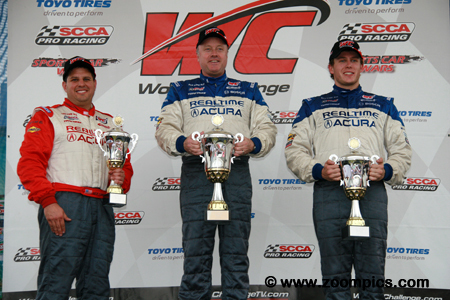 Davis joined his former teammates, Peter Cunningham and Nick Esayian driving an Acura TSX in the GTS division. As a late addition to the entry list, he did not participate in qualifying and started at the back of the grid for both rounds. On Saturday and Sunday, Davis worked his way through the field and finished second in class. World Challenge veteran, James Sofronas drove the No. 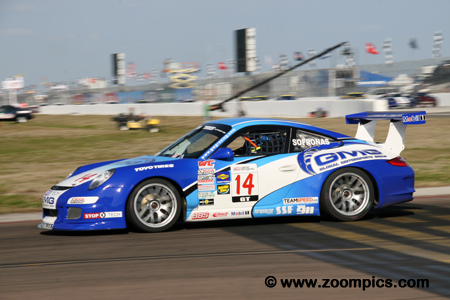 14 GMG prepared Porsche 911 GT3. Sofronas qualified third on Saturday but inherited second when his teammate, Dino Crescentini retired. During the race, he lost a position to Andy Pilgrim and finished third. The following day, an aggressive pass on Pilgrim netted Sofronas the runner-up position and gave him the GT points lead heading to Long Beach. Sunday’s World Challenge Touring Car podium at the Streets of Saint Petersburg. On the left is the local competitor and third place finisher, Mark Hein and to the far right is the runner-up, Robert Stout. Between these two is the race winner, Todd Buras. For Stout and Buras this was a repeat of Saturday’s finishing order. 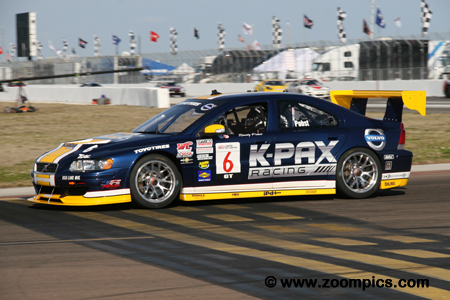 K-PAX Racing entered two Volvo S60s in the 2010 World Challenge series. The No. 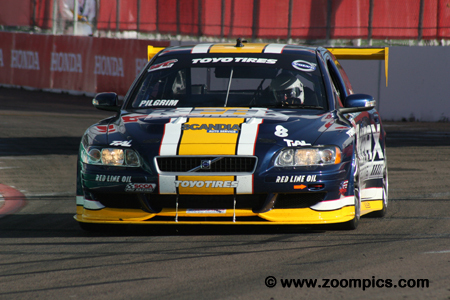 8 Volvo was driven by the 2005 Grand Touring champion, Andy Pilgrim. In round one, Pilgrim was gridded fourth but with the demise of Dino Crescentini and a pass on James Sofronas, he finished behind his teammate, Randy Pobst. Pobst’s retirement on Sunday allowed Pilgrim, to capture the final position on the GT podium. Local racer, Mark Hein driving the No. 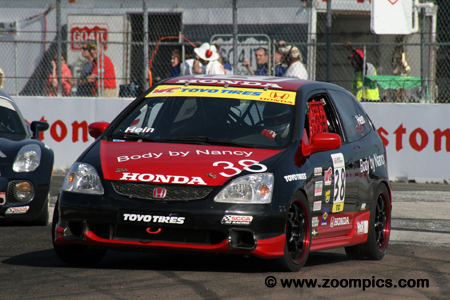 38 Honda Civic Si was the quickest Touring Car competitor. On Saturday, Hein was first in class when he lost the lead to Todd Buras on the lap-16 restart. He was challenged by the Scion of Robert Stout until lap-28 when he retired with a flat tire. The following day, he battled with Buras and Stout and captured the final position on the Touring Car podium. 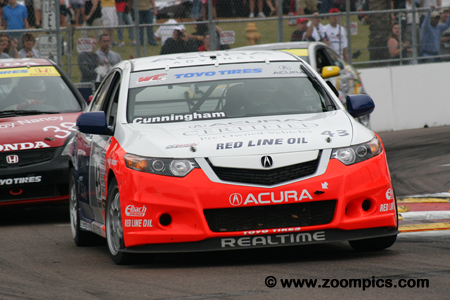 RealTime Racing entered three Acura TSX for the opening rounds of the 2010 World Challenge series. Peter Cunningham and Nick Esayian were scheduled to compete in all the races with Brandon Davis being a late addition to the Saint Petersburg event. Esayian drove the No. 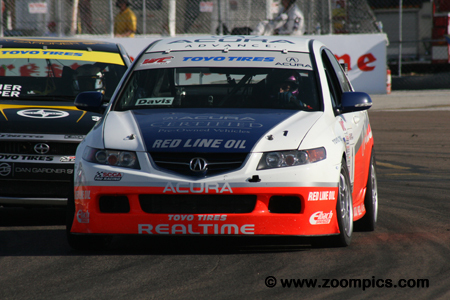 34 Acura and had a steady run both days – he started the season with a pair of third-place finishes in the Grand Touring Sport category. Robert Stout’s teammate, Dan Gardner drove the No. 36 Scion tC. Gardner was gridded seventh in class for the season’s first race and captured the final spot on the podium when Mark Hein retired. His efforts during the contest earned him the Sunoco Hard Charger of the Race award for advancing the most positions. On Sunday, Gardner finished fourth and was again, the recipient of the Hard Charger award. The overall and Grand Touring class podium for Sunday’s round of World Challenge series at the Streets of Saint Petersburg. On the right side of the podium is the runner-up and points leader, James Sofronas. And, on the left side is the driver of the No. 8 K-PAX Racing Volvo S60 and third place finisher, Andy Pilgrim. In the center, and earning some redemption for Saturday’s results is the winner, Dino Crescentini.